Having an HD camcorder that shoots beautiful, large video doesn't do you much good when you can deliver its output only in standard definition. Fortunately, there are a number of ways to share HD video with the world (and be sure to visit our HD camcorder buyer's guide). In the past year, HD in the form of 720p streaming video has come to such sites as blip.tv, Dailymotion, Facebook, Flickr, Motionbox, Vimeo, and YouTube. And you’re welcome to join in by sharing your HD movies on any or all of these services. Each streams HD content at 1,280 by 720 pixels, so it makes sense to save your video in that format (and to deinterlace it if the source is 1,080i) at a data rate of between 3,000 and 5,000 Kbps. The Flash format is commonly used on these sites, but the source material can be .mov, AVI, MPEG-4, or H.264, since the sites generally re-encode what you upload. But each service operates a bit differently. Dailymotion, blip.tv, Facebook, Flickr, and YouTube allow you to upload HD content for free without limiting the number of uploads. However, all these services except Dailymotion and Flickr impose a 1GB file-size limit. (Dailymotion has no limits on file size, and Flickr allows you to upload only up to 90 seconds of video.) Vimeo has a free plan that limits individual movies to 500MB each, allowing one movie per week and 2GB per month. If you pay Vimeo $60 a year, you can upload 1GB movies and upload up to 20GB of movies per month. Motionbox has no limits, but the service costs $30 a year. 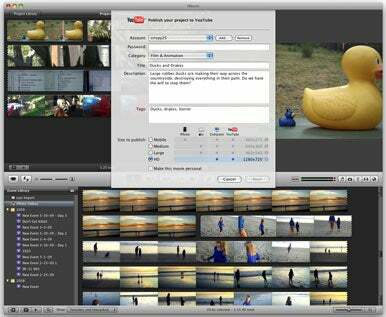 iMovie ’09 includes a handy feature for exporting and uploading 720p HD videos directly to YouTube. Each service provides an upload tool, and iMovie ’09 includes an option for uploading your HD movies directly to YouTube (although MobileMe users can export an iMovie video to a Web gallery, iMovie only offers a maximum resolution of 960 by 540 pixels). Although iMovie ’09 can export directly to iDVD, Apple’s DVD application isn’t capable of burning HD discs. But with Roxio’s Toast 10 High-Def/Blu-ray Disc Plug-in (a $20 add-on for Toast 10) and a compatible third-party burner, you can create Blu-ray discs with your HD content in its native resolution (Blu-ray supports 1080p). The downside is that the DVDs will play only on Blu-ray players, not on standard DVD players, so they won’t be of use to many people. One of the most important ways you can deliver HD video is to yourself in the form of an archive of an AVCHD camera’s contents. Although some of these camcorders can hold a lot of data, trusting your precious memories to that single medium is not a good idea, as all machines eventually fail. iMovie ’09 includes an archive feature that people with AVCHD camcorders should take advantage of (there is no archive feature in iMovie ’08). Just plug in your camera, wait for the Import From window to appear, select your camera from the Camera pop-up menu, and click on the Archive All button at the bottom of the window. iMovie will create a folder, on your hard drive, containing the complete contents of the camcorder. (You can do this manually by copying the contents of the camcorder’s media drive mounted on your Mac’s desktop.) When you later want to access these clips, choose File: Import: Camera Archive, and navigate to your archive folder. The contents of that folder will appear in iMovie ’09 just like the contents of a mounted AVCHD camcorder. Roxio’s Toast Titanium 10 includes an AVCHD Archive function. With it you can choose a mounted AVCHD camcorder and archive its contents to CDs, DVDs, or Blu-ray discs—the program will span the archive across multiple discs if it won’t fit on one disc. When you later insert one of those discs, iMovie ’09 will treat it like the contents of a mounted AVCHD camcorder.